I distinctly remember the cold sensation of total inadequacy as an OB nurse wheeled me down the hall of the hospital with my baby daughter in my arms. We were being discharged. I'd changed my very first diaper less than 24 hours earlier. Technically, biologically, I was now a mother. Emotionally, mentally, spiritually ... not so much. Days stretched into weeks, and weeks stretched into months. Every time I felt like I had a grip on this journey called motherhood that darn kid went and crossed some new developmental milestone and everything changed. Nineteen months after that first visit to the maternity ward, I was back. By now I felt like I knew what I was doing. At least, I thought, I could change a diaper without the nurses having to demonstrate proper technique. And baby number two was a boy. Yep, I had to have a diapering lesson again. And we were climbing up that learning curve all over again. My oldest is married now and has four little ones of her own. My three boys are young men out in the world on their own, and I still don't have it all together as a mother—or a grandmother. These people are still in a constant state of flux. And they're all maddeningly individualized. Each child is like a different college course, in a different department of study. So if it isn't biology or years of experience that transform a woman into a mother, what is it? What is the magical transcendent ingredient that creates a mother from that dual X chromosome? Oh, there are plenty of potential answers: love, compassion, tenderness, responsibility, devotion, support, approval, education, discipline, selflessness, etc. Each one is a wedge in the circle of truth, each one an aspect of motherhood. But there's one that I believe trumps all the rest. One that isn't always mentioned, or declared, or even acknowledged, that transforms a woman into a mother—whether the child is her biological offspring, adopted, a foster child, the friend of child, a niece or nephew, a son- or daughter-in-law, a student, a coach's protege, or a youth pastor's disciple. What is it? Acceptance starts at conception. Accepting responsibility for the pregnancy, accepting the pain of labor, sleepless nights, and so forth. It continues after birth, accepting a child's individual quirks and idiosyncrasies. And so on, through the teen years, all the way into adulthood. It's unnatural, this kind of acceptance. Baby animals born deformed or defective, or born to mothers too young or too old, are frequently rejected. Sometimes animal mothers just don't come with whatever it takes to be a mother. Humans are no different. That rules out nature. The capacity for motherhood has to come from the heart of God, who accepts each of His children and loves us unconditionally. Motherhood has to be yielded to. 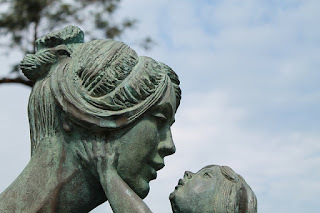 As Mother's Day sneaks up on me again, I find myself asking this question: Do I accept my adult children, each one individually, just the way they are? Or am I just waiting for them to do something different, to conform to my expectations, before I offer them that unconditional acceptance every human being craves? My hat is off to all of you who put in all the time, energy, self sacrifice and love it takes to be good mothers.